A BTEC student at The Sixth Form College, Solihull has been forging a successful American football career alongside her studies and recently finished in third place in an international tournament in Amsterdam. Alice Briggs (aged 18, from Solihull) took part in the Pink Bowl American Football tournament recently, so named because one of the aims of this tournament is to raise awareness of breast cancer. 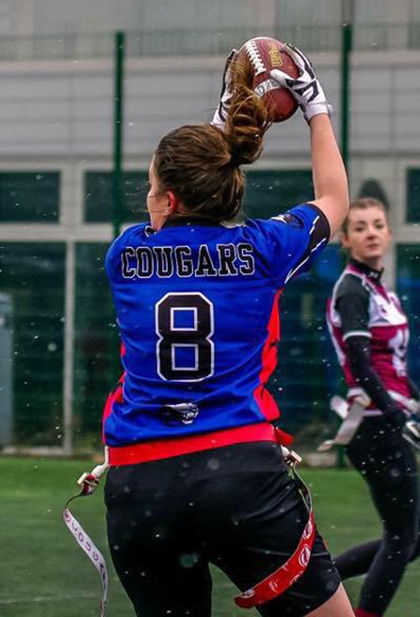 Alice was playing for the Coventry Cougars Flag American Football Team and was up against teams from across the world. Among the teams she played against were Mexican International Ladies, Spanish International Ladies, Team Paris and Team Germany. Her team won five matches and lost two against Mexico and Spain. Alice is currently studying on the BTEC Extended Diploma in Health & Social Care course and juggles her studies with her American Football career, which includes training three times a week and matches every week on Saturdays.